Vouchers and GenBank accession numbers. Visualization KML-file to be used in Google Earth. Avi-film showing Imperial-pigeon in New Caledonia swallowing Planchonella endlicheri fruit. Citation is not yet available for this publication from Systematic Biology. It will become available shortly after the publication appears. Oceanic islands originate from volcanism or tectonic activity without connections to continental landmasses, are colonized by organisms, and eventually vanish due to erosion and subsidence. Colonization of oceanic islands occurs through long-distance dispersals or metapopulation vicariance, the latter resulting in lineages being older than the islands they inhabit. If metapopulation vicariance is valid, island ages cannot be reliably used to provide maximum age constraints for molecular dating. We explore the relationships between the ages of members of a widespread plant genus (Planchonella, Sapotaceae) and their host islands across the Pacific to test various assumptions of dispersal and metapopulation vicariance. We sampled three nuclear DNA markers from 156 accessions representing some 100 Sapotaceae taxa, and analyzed these in BEAST with a relaxed clock to estimate divergence times and with a phylogeographic diffusion model to estimate range expansions over time. The phylogeny was calibrated with a secondary point (the root) and fossils from New Zealand. The dated phylogeny reveals that the ages of Planchonella species are, in most cases, consistent with the ages of the islands they inhabit. Planchonella is inferred to have originated in the Sahul Shelf region, to which it back-dispersed multiple times. Fiji has been an important source for range expansion in the Pacific for the past 23 myr. 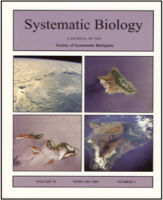 Our analyses reject metapopulation vicariance in all cases tested, including between oceanic islands, evolution of an endemic Fiji–Vanuatu flora, and westward rollback vicariance between Vanuatu and the Loyalty Islands. Repeated dispersal is the only mechanism able to explain the empirical data. The longest (8900 km) identified dispersal is between Palau in the Pacific and the Seychelles in the Indian Ocean, estimated at 2.2 Ma (0.4–4.8 Ma). The first split in a Hawaiian lineage (P. sandwicensis) matches the age of Necker Island (11.0 Ma), when its ancestor diverged into two species that are distinguished by purple and yellow fruits. Subsequent establishment across the Hawaiian archipelago supports, in part, progression rule colonization. In summary, we found no explanatory power in metapopulation vicariance and conclude that Planchonella has expanded its range across the Pacific by long-distance dispersal. We contend that this will be seen in many other groups when analyzed in detail.